One thing about work on Lady Jane, if there is anything that needs doing, there's lots of it to do. 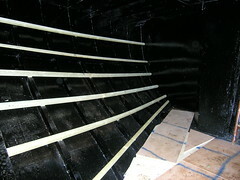 Here you see progress with the rest of the battens in the aft accommodation space. All that remains is the tricky bits right in the aft (back) corners, where access is difficult, and a few pieces on the port side. The battens do look a bit squiffy in the picture, but it all really does makes sense. Next I'll be spraying with the foam insulation, and the place will be completely transformed. As I mentioned, the duck which nested on my deck had seven ducklings, but they all disappeared. Fairly recently, she re-appeared with another large brood. She does appear to be rather a careless mother though as, a few weeks later, she is now down to only two chicks. 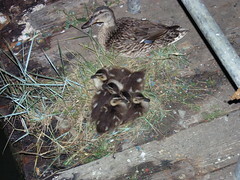 That same duck and another one, with five chicks, regularly stay overnight on the platform. The picture shows the other mother and her five offspring. I note that the ducklings are kept well away from the rest of the Fareham duck posse. 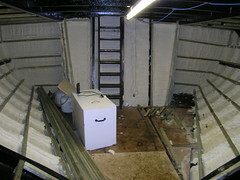 What with the insulation going in and all, my thoughts are now quite naturally turning to heating systems on Lady Jane. It won't be long and it's going to be winter here again. I'm currently thinking along the lines of underfloor heating in the aft accommodation space with radiators elsewhere, until I get around to sorting those spaces out properly. I've spoken to an enthusiastic technical manager who cane to visit Lady Jane, so we'll see what transpires. On the actual heating front itself, I'm planning on getting myself a diesel fired boiler, working on 230 volts through my inverter. I'm favouring Harworth Heating at the moment, as they seem to have plenty of boating knowledge and experience. The heater will also provide the boat's hot water via a storage tank. This is something I'll be grateful for come winter, as the current water heater is gas fired, on demand, and while it heats the water more than enough in summer it is just not man enough for the job in winter, producing lukewarm showers at best. 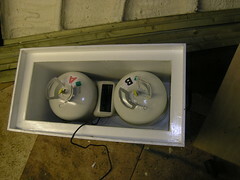 The storage tank will also have a 1KW immersion heater, to use as a backup. Just in case. It had occurred to me that as I'm not short of space, and energy is always a concern, I might try installing two storage tanks - one small one for when there are only one or two of us on the boat, and a bigger one for when I have guests staying over. I'm quite looking forward to the challenges of this particular project, as I've no experience with anything like this. 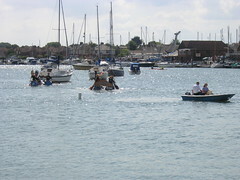 The spray foam insulation project meant that I missed out on the annual Castle In The Air, Fareham Creek raft race. Maybe not a bad thing now that I think about it. I had toyed with the idea of inviting Chantel and John to help craft a raft with the aid of plenty of spray foam, then all of us, including Pat, could have paddled to victory in a sleek, unsinkable, raft. We could have knocked up a shallow hull from flattened out paint tins, or something, and gone for it without fear of becoming waterlogged, or worse, as the spray foam is closed cell foam, thus watertight. I had plenty of paddles from the kayak of course, so propulsion would not have been a problem. Although it was an opportunity almost too good to miss, common sense ruled. They might have thought I was a real weirdo and possibly refused to come down to help at all. I've been looking forward to making this entry for some time now, and it's all turned out so much better than I'd dared hope. 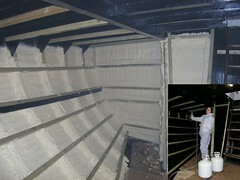 Back in January, I began researching the best options for insulating Lady Jane, and found Spray Foam Insulation Ltd. After a trial, where I experimented with a small spray foam kit of two part polyurethane expanding foam insulation, I found that the spray foam worked really well over bitumen paint. Of course all this went into my blog. As a result I got an excited call from Chantel, of Spray Foam Insulation Ltd, as folk were going to her website via my links. After trading e-mails, and some phone discussion, I bought one of the large spray foam insulation kits, back in February. There was me thinking I'd be spraying sometime then! Shortly after actually buying the spray insulation kit, and after a blog entry where I mentioned Bruce Roberts, a site worth visiting by the way, Chantel offered to come down to help me with the spraying. It turns out that Chantel and her husband, John, had bought cutting plans from Bruce Roberts and will soon be building a steel boat of their own. 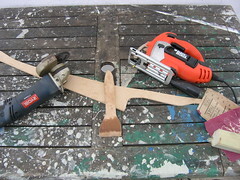 I suspect a new boat building blog will be hitting the internets sometime soon. Once I was finally ready to spray, I emailed Chantel and they arranged to come down the very next weekend. In the event, Chantel and John proved to be a wonderful couple. After a quick lunch in Fareham, we got to doing the actual spraying. 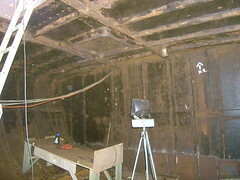 The picture shows the insulation sprayed on the port side of the stern accommodation space, with a picture of Chantel getting ready to start spraying in the inset. The two things that really stood out in my mind were firstly how fast the spraying went and secondly, just how much area we managed to cover from those two, relatively small looking, bottles. 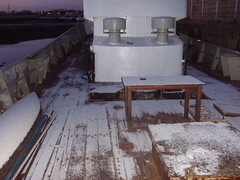 I still have some spray foam insulation left in those bottles, despite doing most of both the port and starboard sides. I've so far spent about three working days putting battens in, easily over 100 metres of the stuff, but these were all sprayed around in literally the space of just over an hour or so (not including a long tea break). What a pleasure in comparison to cutting boards. I've yet to put the remainder of the battens in, and finish spraying the rest of the hull in the stern accommodation, but the back of the spraying project has been well and truly been broken, and I believe I'll finish the rest of it fairly quickly. After the spraying was done, we settled down to a relaxed barbecue (braai) with some other friends, Colin and Arianne. Good food, friends, a few beers (ok so it was quite a few beers for some of us by the end of the night) and some wine on deck in the afterglow of a successful day, what more could one want? Special thanks to both Chantel and John, who are welcome back anytime. By the way, if you have a boat, or anywhere for that matter, needing insulation, you should at least check out Spray Foam Insulation's website at www.spray-insulation.co.uk, or call Chantel for help and advice on 0870 766 8556, Mon - Fri 9am-5pm UK time. I'm making good progress with the rust busting in the fish hold. 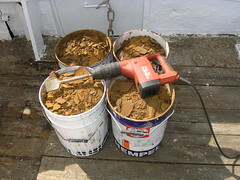 Here you see four drums of rust, the result of a hard day's work (Fred made a healthy contribution to this). The tool you can see is a Hilti TE 104. Probably the best rust busting tool I've come across so far. It has a chuck for chisels and pointy things, to really get into the big, tough, flakes of rust, and a needle gun attachment to get at the rust pitted into the steel. I've previously used compressed air tools, but find the electric Hilti so much more practical to use. No matter what the tool, rust busting is a noisy occasion. 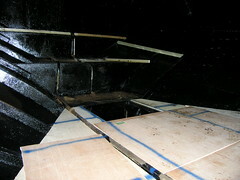 I've made a good start with fitting the battens down in the stern accommodation space. It's quite amazing to see the shape of the hull emerging from the inky blackness that I've become used to. What I've opted to do is to cut small wedges to go on top of the angle iron struts I'm fitting the battens to, this is because the angle iron does not sit at a neat 90 degrees to the rest of the hull. I'm using lengths of 2*2 (50*50mm), as this should produce a flush finish with the one beam that stands proud of all the rest on either side. The 50mm batten, along with the 50mm width angle iron leaves a massive 100mm (4 inches) space for insulation etc. Not that I plan on putting that much spray foam insulation in, as it would prove far, far, too costly. I'm very sure the foam insulation will completely transform the whole space, making it lighter and more comfortable to work in, as currently the sun on the hull, especially with the tide out, makes things pretty warm down there. I'll also need to pay attention to sound insulation from the engine room, in so far as it's practical to do so. Using Hilti nails has made a big difference to the overall efficiency of the operation, cheers Mark. There is still a long way to go though, as I've not yet worked out what to do at the join between the walls and ceiling, nor how I'll fix the battens at either of the ends. I really love bacon and eggs (with toast) for breakfast - I consider it one of life's treats. For the longest time I've not had a frying pan on board, relying solely on the kitchenware left on board by the previous owners. It's a situation that needs to change, but is relatively low on my priority list. Anyway, I've been determined to start earlier and have bacon and eggs in the morning, so finally got around to getting the magic combination of a frying pan, bacon, eggs and thick sliced bread on board. After starting to cook toast under the grill, and while preparing to cook the eggs I realised there was no spatula thingy to lift the eggs from the frying pan once cooked. A knife, or the boat spoon, would not do as it's a non-stick pan. Much to Pat's amazement, I temporarily halted production of breakfast to quickly craft up a spatula from a bit of wood from another project. It turned out ok, and did the job perfectly fine. And yes, breakfast on deck was wonderful. Like so many other 'temporary' arrangements, I've a feeling this spatula may see more action yet! The next project on Lady Jane should be in the forepeak, as the steel there will need cutting out and replacing where it has rusted through and, of course, I've still got to install the anchor and winch - if I ever manage to find the gear I need. To get to do any serious work in the forepeak however, it needs to be cleared out - I have a lot of stuff in the forepeak. The small stuff I use on a regular basis will all go on the new shelving in the steering room, it's the stuff I don't always use, or don't particularly want in the steering room, which will need a temporary home. That 'temporary' home will be shelves in what was the fish hold. The reality is, it's just not practical to store anything in the fish hold at the moment, as it is pretty filthy down there. So with things well in hand elsewhere on Lady Jane, it makes sense to start rust busting down in the fish hold. Whatever happens, it's a job that needs doing. It's a huge space, so it's a big project in it's own right to get the fish hold into a similar state to that the stern accommodation is now in. 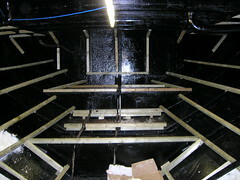 I'm ready to start fitting the wooden struts which will hold the plywood skin in the stern accommodation. There has been some debate about the best thing to use to hold the wood. The old stuff was held in with Hilti nails, or equivalent, and my experience with them elsewhere has been pretty positive. The upshot of my enquiries was that I had a Hilti rep come by to see the boat, to offer help and advice, and of course to sell me Hilti gear. I had put down a temporary deck, just to make working down below a little easier and somewhat safer. We spent a while 'playing' with cool gadgets (a gun really). They have a mighty fine catalogue as well, at least from my perspective anyway. 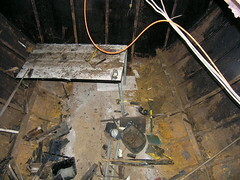 You can see in the picture I now have a few, experimental, bits of wood fastened in the stern accommodation space. There is still an outstanding issue regarding possible corrosion from the treated timber I'm planning on using, other than that it looks like I'll be using a Hilti nail gun and nails. On the one hand, I don't feel important enough to warrant such attention from Hilti, on the other, it is handy to have an expert give the job the once over. After all, I expect this stuff will have to last another forty odd years. Just a quick update on the anodes situation (this post turned out a bit long in the end). After spending some time looking about, I opted to buy the anodes I needed from a shop close by in Fareham - Vitesse Marine. Probably more expensive than I could get elsewhere, but I was worrying that the longer I left it the more unnecessary corrosion problems I would be facing later. I could always research a cheaper supply when I was less pressed, and maybe carry a few spares if I ever got that rich. After a long chat with the guy behind the counter, I bought a set of four zinc anodes which were the same size as those I had on board. I need at least six, but can't afford them all at the same time. I still need to buy more paint and loads of wood this month. When the guy wheeled the anodes I'd just bought out to the truck, they were huge. Much bigger than the ones I had on Lady Jane. He said "I'd be surprised if you had anything smaller fitted, though we do have smaller anodes which would fit the studs on the hull". What I thought was that the previous owners must have fitted smaller anodes, to save on costs. After thinking about it for a while, I opted to buy two big ones (12kg (26.5lbs)) and two of the ones the same size I already had (4kg (8.8lbs)). My reasoning being, the two smaller ones could go back on the rudder, while I would have two big fat ones on the hull, giving Lady Jane even more protection. The shop guy was very patient, considering. When it came to actually fit the things, I realised that in comparison to the good anodes still on the hull, the really big ones were in fact the right size, and that like so many things on Lady Jane, I had simply underestimated the scale of the things. I was pleasantly surprised at how easily the old nuts came off, after just a quick phssst of WD40 and a brief wait, they came right off with no hassle. I was disappointed to find that the nuts and studs were a range of different sizes, but the real problem was that the two big anodes would not fit. I was sure I had measured the distance between the centre of the studs correctly (I had measured a couple of the old ones), and that I had bought the right ones. In retrospect, what must have happened was that although the right size was on the invoice, I was simply given the wrong ones. (220cm between centres, rather than 225cm between centres). After much deliberating, I chose to go ahead and secure the big anodes on with just the one nut, and see about changing the two smaller ones for the larger versions, with the right distance between the centres during this week. At least this way, the protection starts immediately. Also Lady Jane is not going anywhere soon, so they should be just fine as they are, held on with only one nut. When I replace them, I'll replace them with the right size and, who knows, maybe even get uniform sized studs and nuts at the same time. 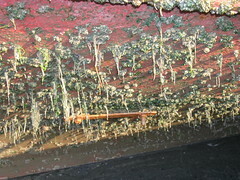 I would have taken a picture of the shiny new anode(s) in place, but I was quite muddy and my knuckles were dripping blood, from the barnacles encrusted on the hull near where I was working, (another lesson learned) all of which put me off going down and back up that ladder again.